I like that Best Made offers products that remind you of what it would be like to be a Boy Scout for life – even offering some great patches. 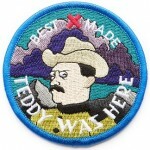 Like the “Teddy was Here” badge that features the patron saint of American adventurers, Teddy Roosevelt. See all the greatness that is Best Made here. Lost Cowboy is powered by	WordPress 5.0.4 and delivered to you in 2.215 seconds using 43 queries.